The ENVE M7 cockpit combo looks as good as it performs. 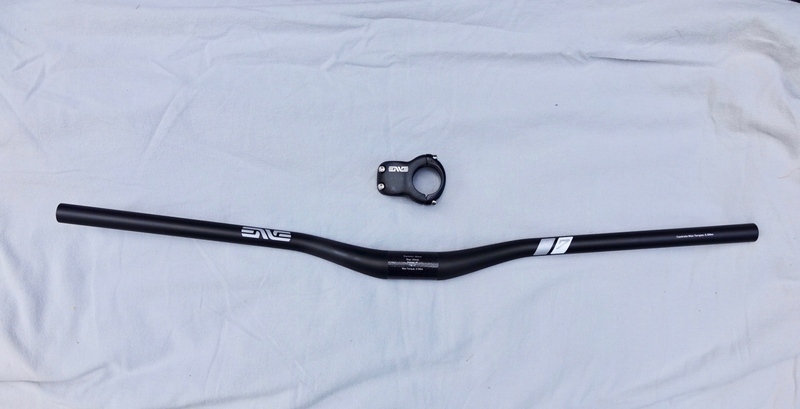 ENVE has added a 35mm carbon stem-handlebar combination to its component lineup, corresponding to its M series of carbon mountain bike wheels. The gravity/enduro-focused M7 cockpit features 35mm, 50mm, and 65mm stems paired with trimmable 800mm bars in a variety of rise configurations. With its M5 and M6 sets in 31.8mm clamp size, ENVE also broadened its XC/Trail offerings. Mtbr tested the ENVE M7 cockpit with 35mm/zero rise stem paired with bars that have 25-degree rise, 8-degree backsweep, and 4-degree upsweep. ENVE’s move into the 35mm clamp-size realm caused some trepidation. Their early carbon wheels had a reputation (later addressed) for being harsh, and 35mm bars generally struck me (and lots of other riders) as overly stiff. Would the new cockpit components measure up to the comfort and responsiveness of its predecessor, ENVE’s 31.8mm carbon Mountain stem-bar combo that Mtbr reviewed here? No worries. The ENVE M7 cockpit keeps all the compliance of its 31.8 cousin, while adding numerous setup options to the mix. 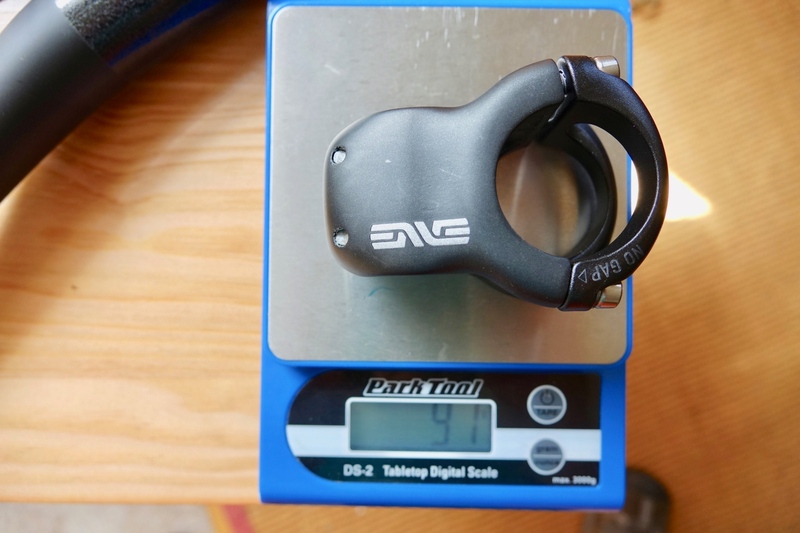 The ENVE M7 stem weighs a scant 91 grams in the 35mm length. The ENVE M7 stem is still strong and crazy light (91 grams), which includes aluminum faceplate and titanium hardware. 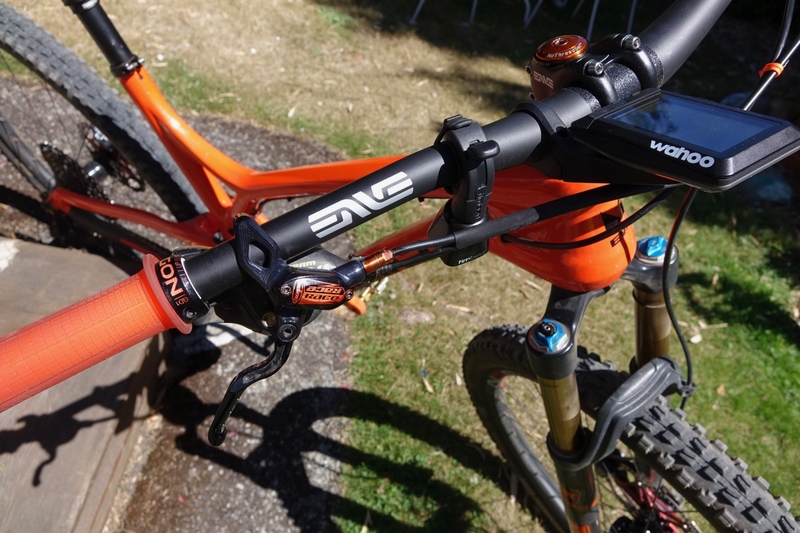 The ENVE M7 bars, while a tad heftier than the XC models at 240 grams (before cutting), are plenty light given their extra volume, but also stiff with just the right damping to hit the sweet spot between trail sensitivity and rider comfort. Although still early in the season, my local trails are getting blown out from dry weather and heavy use. But whatever drawbacks pitted berms and brake-bumped switchbacks inflict on ride quality, they’re perfect for testing cockpit performance. 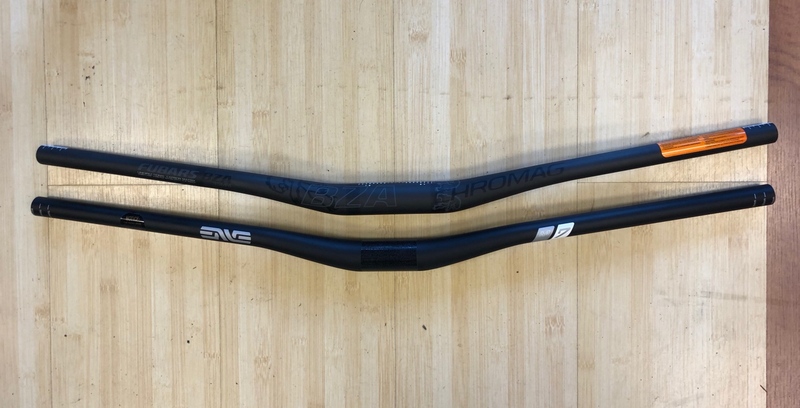 Comparing the ENVE M7 bar with other bars shows its sleek lines and feathered taper. I tried the ENVE M7 cockpit combo on four bikes spanning XC to enduro. This was strictly for test purposes; the M7 line is meant for gravity/enduro, while the M5 and M6 series are aimed at XC and trail. There’s also a 31.8mm-clamp diameter 810mm M9 bar for core DH. Swapping out aluminum-carbon cockpits for the ENVE offering paid noticeable dividends no matter the bike’s orientation. A sampling of our ENVE M7 cockpit test track. 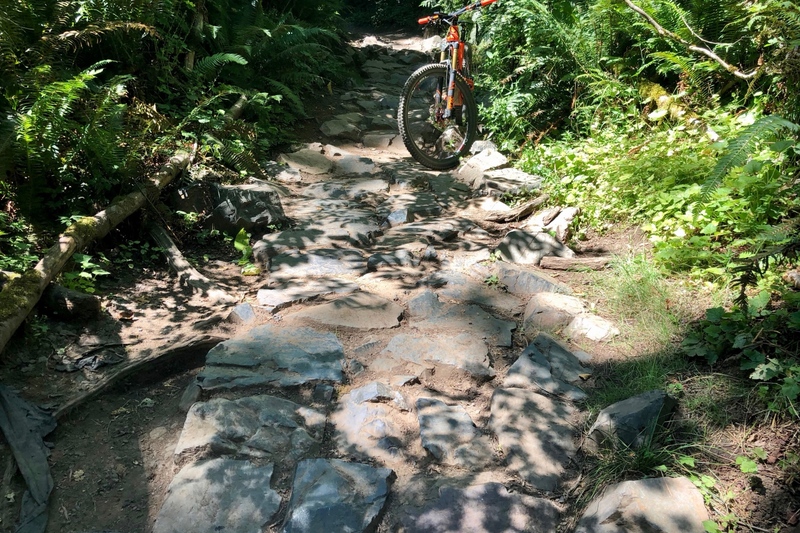 One 3-mile descent, an actual creek bed before being converted to MTB use (it’s still is a creek bed in winter), has a reputation for bouncing eyeballs. And while even the ENVE M7 cockpit couldn’t transform the trail into a magic carpet ride, there was a striking reduction in fingertip sting and wrist ache after the bronco-busting descent. But the payoff of the ENVE M7 cockpit isn’t just in the rough stuff. Over time the constant jarring of mountain biking takes a toll on hands, arms, and shoulders. I know a few seasoned mountain bikers who’ve faced surgery to deal with hand numbness and nerve trauma. ENVE’s handlebar sticker kit, included with purchase, matches its wheel stickers and popular frame colors, including the Evil Following MB’s Smashing Pumpkin. The ENVE M7 cockpit setup is a bit elaborate and requires a torque wrench. The upper faceplate bolts tighten first and go flush, with the lowers following. Then all bolts require quarter-to-half turns till proper torque is reached. 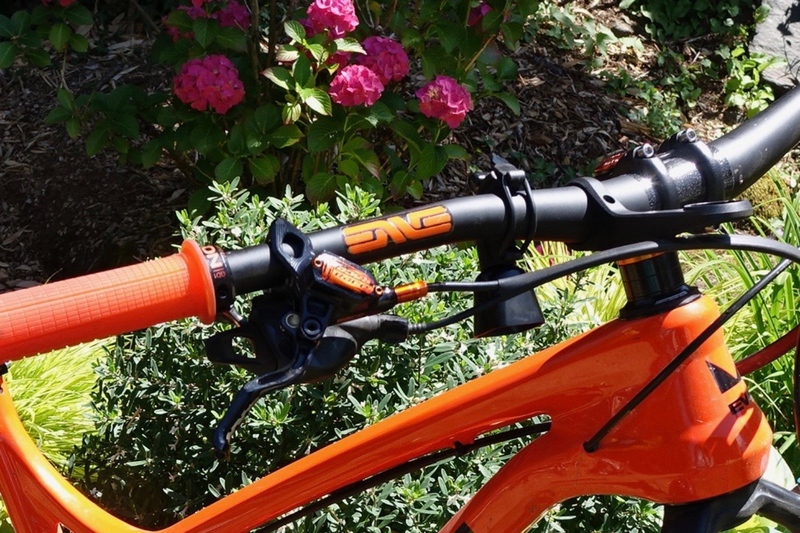 Also be sure to put at least one spacer under the headset cap as well as below the stem. Steer tube bolts also must be torqued to spec. ENVE helpfully prints the torque specs (5.5Nm) on the stem, as well as its length. I appreciate these touches — how often have you had to get out the tape measure to confirm a stem length that ought to be in plain sight on the component itself. ENVE M7 cockpit decals nicely match our test bike. 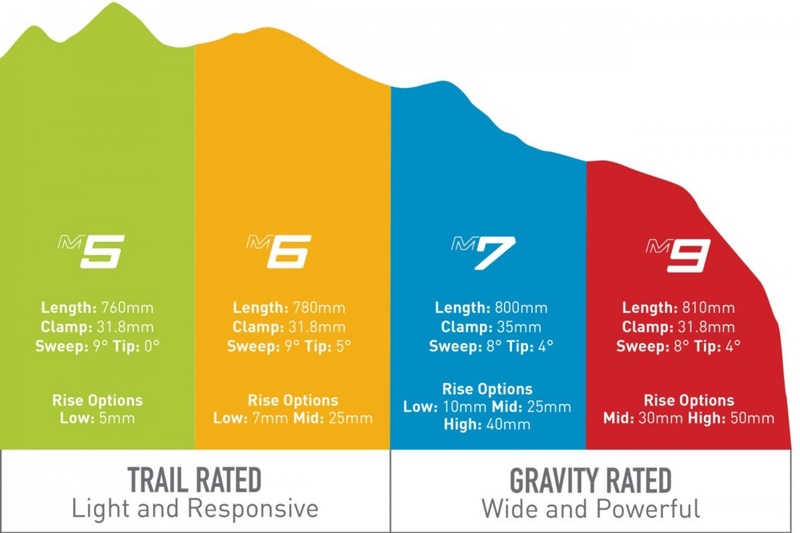 ENVE has also reduced the number of cut marks on the M7 bars, and advises sticking with its increments to assure optimal performance if you do decide to trim. Riders may gag at the stem’s hefty $280 price tag (the $170 bars are more in line with the competition), yet they will eagerly pay hundreds more for carbon rather than aluminum rims. Yet the tradeoffs are essentially the same. Cockpits tend to be an afterthought focused more on set-up specs than performance. But the new ENVE M7 cockpit has upped the game in both departments. Bottom line, ENVE is renowned for R&D, lab and ride testing, and while they may have come comparatively late to the 35mm game, their design and engineering meticulousness shows in the M7 35mm cockpit. Here’s a rundown of all the new ENVE cockpit offerings. ENVE M7 cockpit decals before. No thanks, I’ll keep using Deity stem and their enduro carbon bar and save about half the cost of the ENVE combo. The quality is great with ENVE, but the price point is steep. Whatever the marketing spins, this is just a stem. At this length it can’t do nothing to reduce front end harshness and thicker handlebars don’t help either. Diminishing returns (or just a placebo) for crapload of money. Monster cables for your derailleur are next. Like always two years, too late. Stem isn’t lightest as it’s mentioned in some reviews (not hire). Some German made “ENDURO” stems are lighter and twice cheaper and coming in nice anodized colors.